This is the big a$$ cake I promised you. You probably don't remember, but I made this cake once before. The problem was that the recipe was wrong. So I didn't know how really yummy the cake was. I've made those a million times. This cake is a little insane. Insane is what I call food that has way more stuff in it than it needs to taste good. Like a Bacon Cheeseburger. A really good hamburger is really good. Add cheese and that's ok. But bacon too? That's 3 high fat proteins on the same sandwich. That's insane! Is that enough insanity for you? The last time I made this cake the person I was making it for wanted chocolate butter cream frosting. So I substituted the butter cream for the chocolate ganache that the recipe called for. The people I made it for this time said "it's just a mouthful of chocolatey goodness." What do you say? Would you like a bite of this insanity? 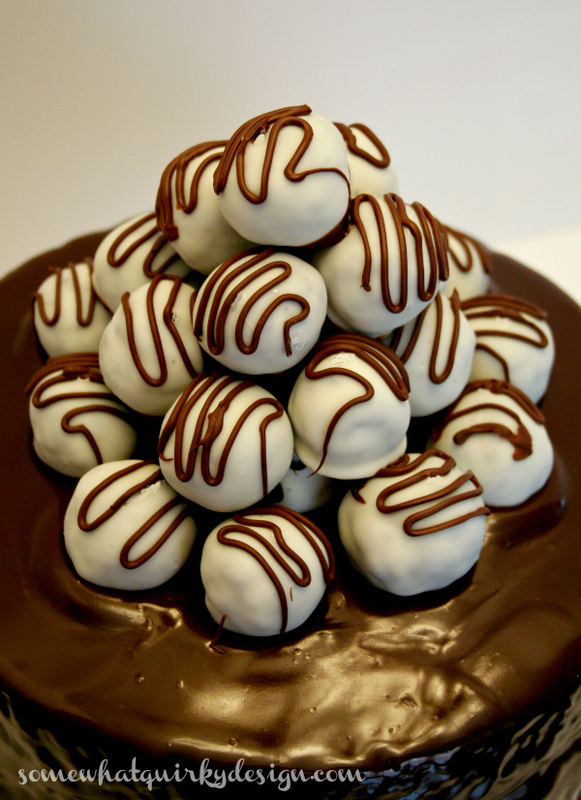 You can get the recipe for the Oreo Truffles here. The (corrected) recipe for the cake is here. 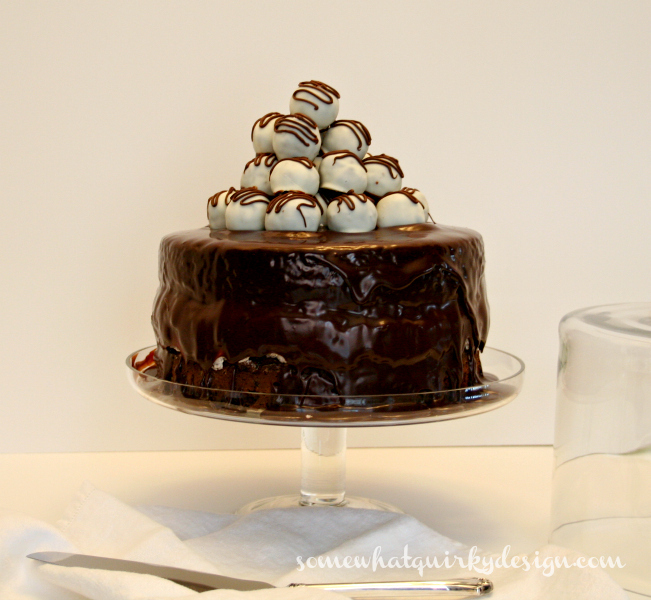 If you would like to use chocolate butter cream for the icing you can get the recipe here. Makes me want to be insane. Just long enough to eat a piece. 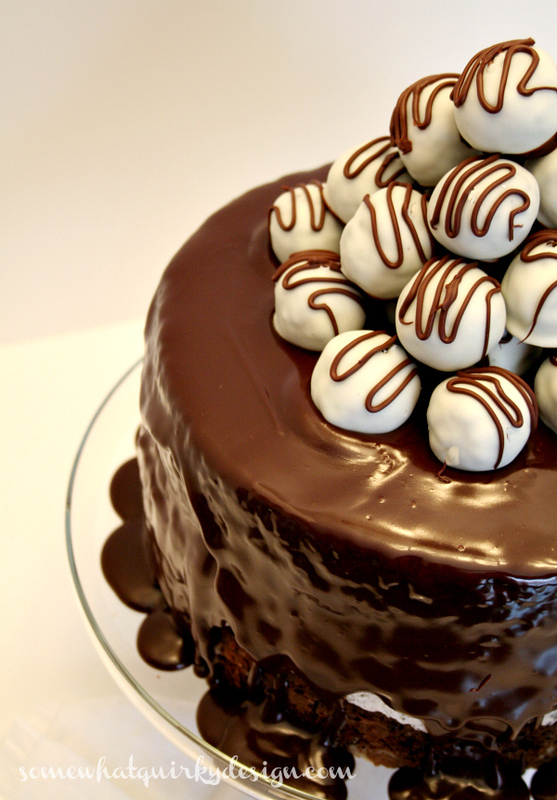 Would you like one of these for your birthday? What is your favorite insane food? If you are thinking of making this cake and want just a little less insanity, make it without the cheesecake layer. 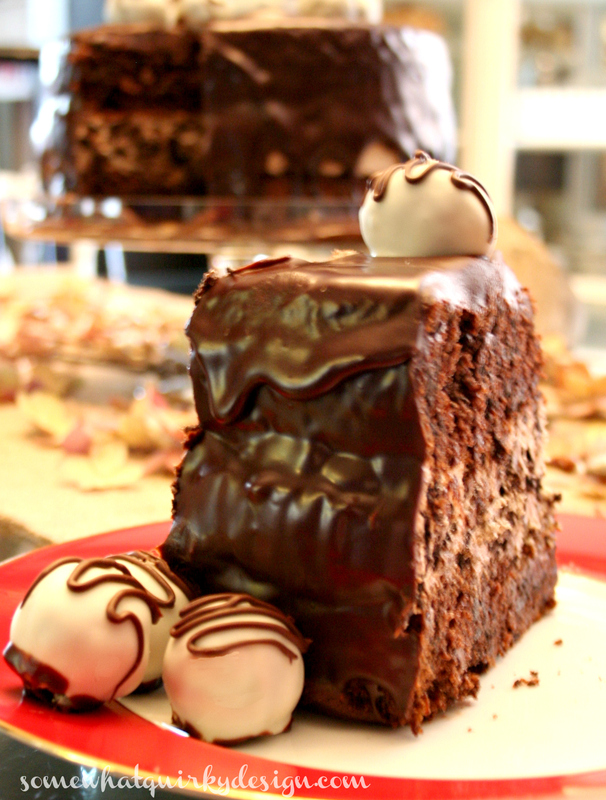 Just put some ganache in between the layers and it would be heavenly. Or use the chocolate buttercream. Either way it's still gonna be chocolatey goodness! 1. 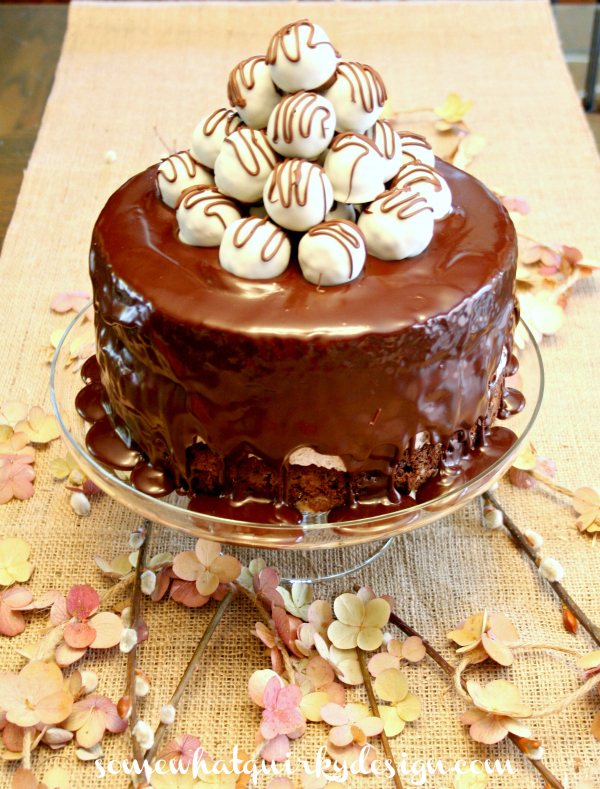 Layer the chocolate cake the the no-bake cheesecake in your springform pan, with a chocolate cake layer on the top. 3. Run a warm knife around the side of the pan, and then release from pan. Stop making me gain inches just looking at your yummy deserts. And, regarding your comment on my blog - next winter you need to leave your cold climate and come shopping/eating with me. Old Towne Orange or just the cute little vintage shops in my home town. For the love of GOD will you stop enticing me to make this stuff? That cake should be called Insanity Cake. Good heavens, how much does that cake WEIGH? It looks and sounds de-lic-ious! 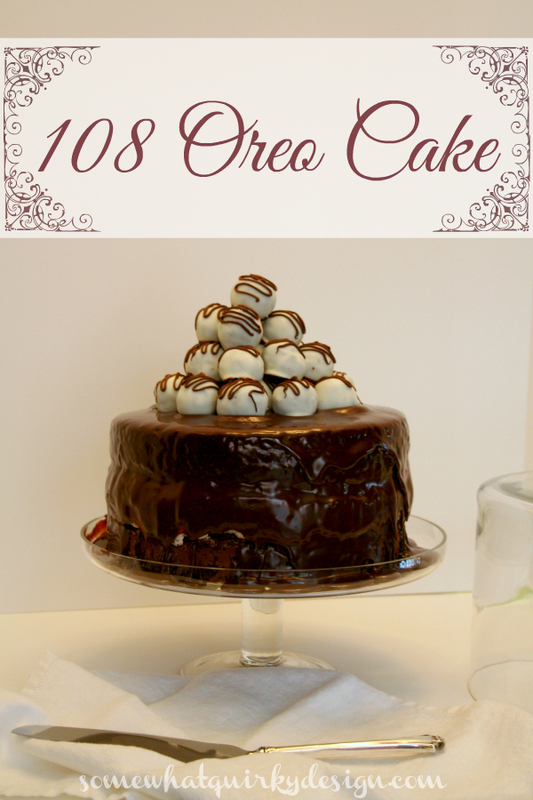 You had me at OREO - have to pin this right now! This is for Teddy Grace - I can't find a way to contact you Teddy. Here is the answer to your question. Take one of your cooled cake layers and place it in the springform pan. Then put all of the cream cheese mixture in the springform pan. Lay the 2nd cake layer over everything. It won't all fit into the pan of course, but it will all stay together. Wrap securely with foil. Then wrap again with foil. Put it in the freezer - somewhere it can sit level. after it is frozen you can slip it out of the pan with no problem. My cousin's daughter loves Oreos and asks for Oreo cake for every birthday. I have to send this to her mom to make this year. Where's my slice? Looks so good!